CRAZY RUMORS Natural Lipbalm Piña Colada give your lips the taste of Piña Colada: a perfect cocktail between pineapple juice and creamy coconut! Its formula rich in organic shea butter nourrishes and protects your lips, they are smooth and delicately fragranced. Crazy Rumors Lip Balms are 100% natural, cruelty-free (not tested on animals) and vegan (no animal-derived ingredient). Un peu déçue par l’odeur. Mais le fait qu’il possède beaucoup d’autres qualités surpasse ce point négatif. 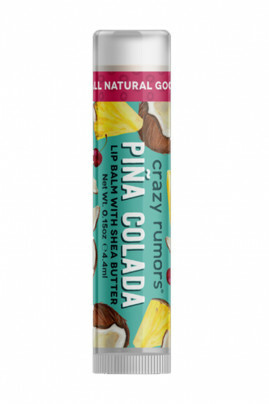 A smell of Piña Colada on your mouth with Crazy Rumors Lip Balm!